When your performing ensemble grows beyond eight performers, it’s time for your personal mixing system to expand as well. Using A-Net makes that easy; there’s no practical limit to the size of an Aviom personal mixing system. 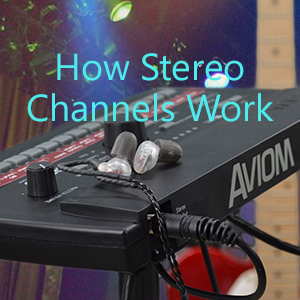 We’ve seen systems that accommodated as many as 50 musicians at a time. That’s a lot of Cat-5 cables! Once your input sources are configured (from analog input modules, digital console cards, or a Dante network) the A-Net digital signal gets connected to an A-Net Distributor that feeds up to eight Personal Mixers. When it’s time to expand, all you need to do is connect the A-Net Out port on your first A-Net Distributor to the A-Net In on the next one. This will copy the multi-channel digital data exactly and provide another eight A-Net outputs (with DC power) for Personal Mixers. The example below shows a pair of D400 A-Net Distributors being used to provide A-Net to 16 Personal Mixers. When you have a system with a lot of network inputs, expanding brings along some extremely powerful features. If your first A-Net Distributor is a D800 or D800-Dante, up to 64 network inputs can be available to your Personal Mixers. The A-Net Out on the D800 distributors will pass all 64 network channels to every A-Net Distributor Aviom makes. So you could expand your system by adding another D800, a D400, or even a legacy A-Net Distributor like the A-16D Pro. The example below shows a D800-Dante connected to a Dante network (blue cable), bringing in up to 64 sources. A D400 is connected with a Cat-5 cable from the D800-Dante’s A-Net Out port to the D400’s A-Net In port to expand the network for an additional eight users. 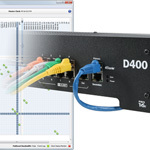 All 64 network channels are available at the D400’s A-Net ports. Add more A-Net Distributors as needed; there’s no practical limit. Note that if you are using the D800-Dante version of the product as a second or third A-Net Distributor for your system, you need to disable the Dante interface to enable the A-Net input. That is done by moving the last DIP switch in the first block (marked ‘Disable’) to the UP position. 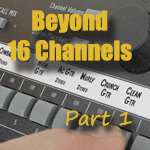 It’s important to remember that even though 64 network channels pass through all A-Net Distributors, it’s the Personal Mixers that determine which sources can be used. Legacy Personal Mixers like the A-16II use only the first 16 network sources, and will ignore those from 17-64. The A320 Personal Mixer can make use of the first 32 network channels (as 16 stereo pairs), and will ignore channels 33-64. The A360 Personal Mixer is the most powerful in this situation because each A360 in your system can be individually programmed to use any of the 64 network sources by using the free A360 Channel Manager software. And, yes, all three types of Personal Mixer can be used at the same time in one system. We also have a series of posts about increasing the channel count of your network’s input sources. This four-part series walks you through adding additional inputs to analog, console card, and Dante-based personal mixing systems.